New Utilities is the set of system tools for every day: fix registry problems, clean registry, remove temporary files, tweak Windows, manage startup list – work with maximum performance! File utilities allows to find files by your criteria, make searching of private records inside Office and notepad documents, rename a group of pictures, replace a string in text files, safely erase confidential information, encrypt and decrypt a data. Despite the fact that modern operating systems provide virtually all possible maintenance and monitoring tools, using them is often a disappointing process. To begin with, they are quite basic and lack the flexibility of third-party products available on the market. They are also scattered across the system, which makes it hard for beginners to take full advantage of their capabilities – some people don’t even know of their existence! If you need an all-in-one tool for system maintenance and tweaking, New Utilities has a good chance of becoming your software of choice! 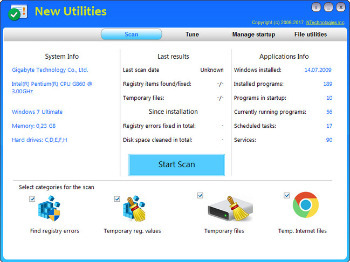 New Utilities is a versatile tool intended for performing a number of vital system maintenance and optimization tasks. First of all, it provides a detailed snapshot of your system configuration, so you always know which devices are currently installed in your computer and use this information while communicating with support personnel when needed. If you are having problems with the system registry, don’t worry – New Utilities will fix it in no time. If the system reports a free space error on one of the drives, use New Utilities to wipe out the unnecessary temporary files. Other features include: files uneraser, process manager, startup/uninstall manager, IE optimizer, an Outlook tweaker and a work history cleaner. All system information will be gathered and shown on main window: general characteristics, information about processor and memory, installed applications and currently running services, etc. – no need to find different properties in order to know the computer parameters. The Windows registry is a directory which stores settings and options for the operating system for Microsoft Windows versions. It contains information and settings for all the hardware, operating system software, most non-operating system software, users, preferences of the PC, etc. Whenever a user makes changes to Control Panel settings, file associations, system policies, or installed software, the changes are reflected and stored in the registry. The registry also provides a window into the operation of the kernel, exposing runtime information such as performance counters and currently active hardware. Uninstalling or changing software, hardware and drivers never leaves a PC clean. Entries are left behind in the computer registry causing the PC to become unstable and corrupted – has sudden crashes, system failures and unknown error messages that ultimately cause a severe lag in the PC’s performance. Drive Cleaner – part of scan which collect temporary internet files, recently used program lists, history and other online and offline items on your computer. Startup items are the programs that run when the PC first starts, using up system resources (usually unnecessarily). A couple of examples would be QuickTime, camera software, etc. These programs use up system resources and slow down your PC. Use startup manager to modify your startup list.